This headline in a recent Adnews - "Brissie Times grows market" - caused a chuckle. Lovely spin from the Fairfax Digital guys, but the numbers don't reflect reality. 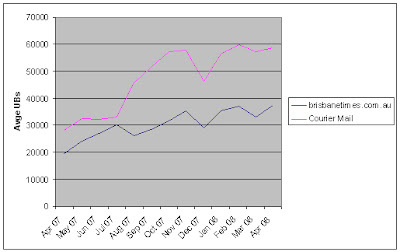 The chart above shows the 12 month growth in UBs to the Courier Mail and the Brisbane Times since the launch of the Brisbane Times. At first glance it's impressive enough - both trending up; the newcomer snapping at the heels of the incumbent which lifts its game in response. At least that's how Adnews reported it. And of course, that's what Fairfax wanted. "We've actually grown the online news reading habit," said Pippa Leary, MD of media at Fairfax Digital. "When we tested people before entering the market we found they weren't interested in hard news or credibility. Now that's changed." Well, I'm not so sure about that. Let's look at the numbers a little more closely. Keeping in mind that Brisbane has a population of nearly 2 million, that means on this calculation around 75,000 people a day are looking at the two news sites, and that's not taking into account any duplication between the two audiences. In other words about 3.75% of the population is interested in "hard news and credibility". But actually the number is a lot smaller. And the reason is that most of the audience viewing these sites actually comes from outside Queensland. Rather than growing the news audience in Brisbane, what Fairfax Digital and News Digital Media are doing very well is moving traffic from their high volume sites in Sydney and Melbourne to their Brisbane sites. Fairfax is exceptionally good at this. But News Ltd has a slight home town advantage with the Courier Mail brand reflected in stronger local viewing numbers. In a trade release this week announcing the success of their new product, The Vine, Pippa Leary gave something of an insight into how Fairfax Digital uses its big traffic generators to spin off new commercial products. "We were looking at fairly aggressive growth, but were surprised to get four times that in the first three weeks," said Leary. Leary said Fairfax Digital had done "almost nothing" in the way of marketing the site other than directing existing Fairfax Digital users to the site through cross-promo ads on the SMH and The Age websites. It's clear that only one-third of traffic to the Brisbane Times comes from Queensland. And a little more than half the Courier Mail traffic comes from Queensland. Almost everything else comes from Sydney and Melbourne. I haven't bothered including the other states as they only contribute about 10% of traffic to both sites. So in terms of "growing the market" the total figures mentioned above, and those used by Adnews, don't illustrate any real growth in the local online news category for Brisbane. It is good spin, though. the same spin doctors were at work spruiking thevine.com.au's 'success' ... which interestingly isn't being monitored on MI/Site Census (despite all other FD properties being on the platform) and comes in with under 50k users according to Netview. Great spin, but hardly accurate.